The University of Melbourne is seeking a Manager, Major Gifts and Fundraising for the Faculty of Business and Economics. Here’s the job advertisement. It’s a senior position and one of the key selection criteria is experience of major donor fundraising experience in a tertiary institution, and/or relationship management experience in for-profit sector, with a proven track record in raising significant sums of money. 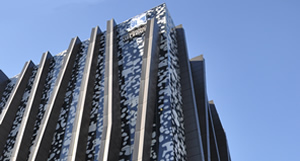 At Melbourne, the fundraising staff are decentralised and located within the faculties, rather than working as a centralised advancement team (as at Monash University). What are your views on centralised versus decentralised? Do you think it means potential donors and alumni are likely to be approached by more than one university department, or are there good ways to share donor information to ensure that all approaches are coordinated? The image used is The Spot, Faculty of Business and Economics Building. 198 Berkeley Street, Parkville. This entry was posted in fundraising, higher education, philanthropy and tagged advancement, cultivation, development, fundraising jobs. Bookmark the permalink.